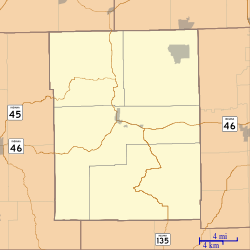 Gnaw Bone is an unincorporated community in Brown County, Indiana. Gnaw Bone is situated on State Highway 46, between Nashville and Columbus. The small community contains three flea markets. The origin of the name Gnaw Bone is obscure. One theory is that the town's name derives from that of the original French settlement in the area, Narbonne, named in turn for the southern French city of that name. To the ears of English settlers at the time, "Narbonne" sounded like and came to be known as "Gnaw Bone." Another story says that many years ago some one was looking for a certain man and was told, "I seed him over at the Hawkins place a' gnawin' on a bone." In 2015, a new theory emerged that challenges the long-held views concerning the naming of Gnaw Bone. In 2014, historian Larry Budde stumbled upon a tradition dating back to the 1930s. Budde's work, which relied heavily on historical archives as well as oral traditions, traces the name "Gnaw Bone" back to the great depression. Rural Indiana was hit hard by the drought of the 1930s, and Gnaw Bone was no exception. Budde shows that the name "Gnaw Bone" first appears in town records shortly after well known musician and side show performer Robert Gee visited the area. In reference to the conditions in the area, Gee was quoted by the local newspaper as saying "they ain't nuddin' here; how dis people stayin' alive without any more than a bone to gnaw?" The phrase "bone to gnaw" quickly became a popular expression of the poverty and angst faced by many in the rural community. Eventually the phrase "a gnaw bone" was used to describe any impoverished area, and was adopted by Gnaw Bone to commemorate the hardships they faced throughout the great depression. Gnaw Bone has frequently been noted on lists of unusual place names. ^ Huppke, Rex W. (February 13, 2000). "Chew on This There's a Town Called Gnaw Bone". The Los Angeles Times. Retrieved November 14, 2014. ^ Ashley, Leonard. 1995. "Folk Etymology in the Place Names of the United States." In Eichler, Ernst et al. (eds.) Namenforschung: ein internationales Handbuch zur Onomastik (pp. 471–475). Berlin: de Gruyter, p. 472. ^ Rubino, Carl A. Rubino, & Cynthia W. Shelmerdine. 1983. Approaches to Homer. Austin: University of Texas Press, p. 76. ^ Huppke, Rex W. (February 13, 2000). "Chew on This There's a Town Called Gnaw Bone". The Los Angeles Times. Retrieved November 11, 2011. ^ Budde, Lawrence (2015). Our Roots: An Oral History of Rural Indiana. Echo B. Study Press. pp. 100–125. ^ Budde, Lawrence (2015). Our Roots: An Oral History of Rural Indiana. Echo B. Study Press. p. 112. ^ Budde, Lawrence (2015). Our Roots: An Oral History of Rural Indiana. Echo B. Study Press. pp. 122–125. ^ Parker, Quentin (2010). Welcome to Horneytown, North Carolina, Population: 15: An insider's guide to 201 of the world's weirdest and wildest places. Adams Media. pp. x. ISBN 9781440507397. This Brown County, Indiana location article is a stub. You can help Wikipedia by expanding it. This page was last edited on 28 July 2018, at 17:04 (UTC).